A Totally New Kind Of Wheel Brush! 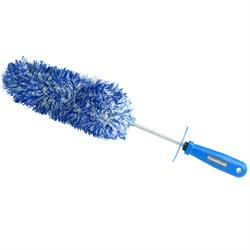 Microfibre Madness are known for releasing innovative and useful car care products and the IncrediBrush is no exception. Using their microfibre noodles around a central foam core, the IncrediBrush reaches easily between the spokes of even the most intricate of wheel designs, ensuring a thorough clean. The foam core retains wash water, releasing it continuously as the wheel is washed, helping flush away dirt and reducing the chances of scratching sensitive wheel finishes. I already have the 3 set wheel woolies but get fed up having to keep changing brushes to reach the tighter areas. I bought this microfibre brush believing that it could replace them and do it all. The advert states it reaches easily between the spokes etc. Well it doesn't. It wouldn't fit between my simple design five double spoke Mercedes wheels where the gap between spokes is about a 1cm. It also wouldn't clean the complete rim under the brakes. I had to use my small wheel wooolie for these jobs. I ask myself why then have I spent £39 on this brush. I suppose there is a reason why wheel woolies come in 3 different size brushes and that is because one brush can't do it all. This one definitely can't, save your money.